Memory — that is, real RAM — is a precious commodity when applying destructive filters. 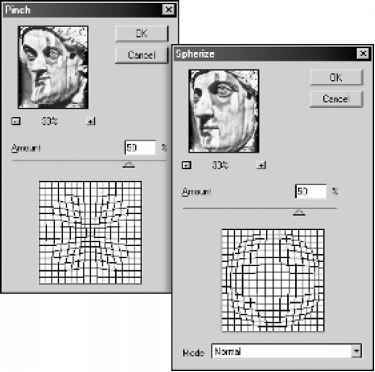 As I mentioned in Chapter 2, the scratch disk space typically enables you to edit larger images than your computer's RAM might permit. But all the filters in the Distort submenu and most of the commands in the Render submenu operate exclusively in memory. If they run out of physical RAM, they choke. Fortunately, there is one potential workaround: When editing a color image, try applying the filter to each of the color channels independently. One color channel requires just a third to a fourth as much RAM as the full-color composite. Sadly, this technique does not help either Lighting Effects or Lens Flare. These delicate flowers of the filter world are compatible only with full-color images; when editing a single channel, they appear dimmed.